Boarding at either 11.00am or 6.30am on the MV Calypso Star, enjoy a cruise to Hopkins or Grindal Island with an island lunch stop along the way (on the 11.00am boarding tour). 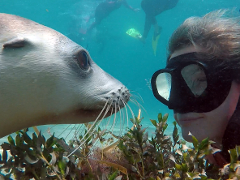 At Hopkins Island you will have the opportunity to jump in and swim, viewing the mesmerised skills and abilities of these gorgeous animals, or sit back and enjoy the action from the comfort of the vessel. In the afternoon we depart Hopkins Island and make our way to Neptune Island Marine Park, then it is time to cage dive with the magnificent Great White Shark! Your evening consists of cage diving, a dinner at sea, then cruise home enjoying the sunset and a drink after bar opens! During some months this tour also boards at 6.30am. On this trip the tour maybe run in reverse and breakfast is served instead of dinner. Length of the tour is approximately 10-12 hours. 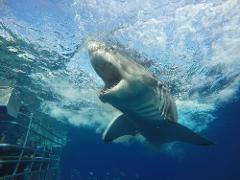 Port Lincoln being the only place in Australia where you can cage dive with Great White Sharks. Awarded the Best Adventure Tour & People's Choice for the Best Attraction at the 2018 South Australian Tourism Awards, more people choose to cage dive with us than any other operator in Australia! Advanced Eco Certified Calypso Star Charters is proudly Carbon Neutral and a Climate Action Leader providing safe, exciting and sustainable shark cage diving tours. Market leaders, Calypso Star Charters are privileged to be the only one-day Shark Cage Diving operator who is permitted to use natural fish berley to attract Great White Sharks. This sustainable practice provides you with the best possible chance of a shark sighting and productive interaction close to the vessel and cage resulting in a memorable encounter and wonderful photographic opportunities. 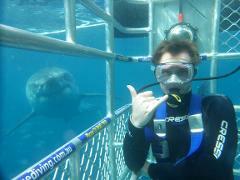 Shark sightings since January 2011 are displayed on our website with daily updates on our social media, giving an honest representation of when it is the best time to come. No diver experience is required, all food and equipment is supplied. Book yourself an adventure today! This is a small group tour with a limit of 25 people onboard. Diving will be conducted in groups of up to 6 people at a time. All diving will be conducted during daylight hours. with an estimated return time of 10-11pm. Accommodation transfers can be booked via the office prior to 5.30pm the day before the charter. Those who have booked transfers will be picked up between 12.45 - 1.00pm. If you are making your own way to the boat please ensure you arrive by 1.00pm. Travel time to the Neptune Islands is approximately 2.5 hours, and we do travel through open ocean. We STRONGLY recommend you take travel sickness medication as a precaution, taking one the night before your charter and one again the morning of before arrival at the Marina. Afternoon tea, dinner, cappuccino and filtered water included. Soft drinks and bottled water are available for purchase throughout the day. As a licensed vessel the bar opens on the way home with beer, wine and champagne available for purchase.